Dependent on local climate, which is affected by the distance to the sea, the exposition and the latitude (from 23°N to 25°S), the altitude varies from 500 m to 4000 m above sea level. Typically, there is a relatively small band of altitude in which the atmospheric environment is suitable for cloud forest development. This is characterized by persistent fog at the vegetation level, resulting in the reduction of direct sunlight and thus of evapotranspiration. Within cloud forests, much of the moisture available to plants arrives in the form of fog drip, where fog condenses on tree leaves and then drips onto the ground below. Annual rainfall can range from 500 to 10,000 mm/year and mean temperature between 8 and 20 °C. While cloud forest today is the most widely used term, in some regions, these ecosystems or special types of cloud forests are called mossy forest, elfin forest, montane thicket, and dwarf cloud forest. The definition of cloud forest can be ambiguous, with many countries not using the term (preferring such terms as Afromontane forest and upper montane rain forest, montane laurel forest, or more localised terms such as the Bolivian yungas, and the laurisilva of the Atlantic Islands), and occasionally subtropical and even temperate forests in which similar meteorological conditions occur are considered to be cloud forests. Only 1% of the global woodland consists of cloud forests. Important areas of cloud forest are in Central and South America, East and Central Africa, Indonesia, Malaysia, the Philippines, Papua-New Guinea, and in the Caribbean. In comparison with lower tropical moist forests, cloud forests show a reduced tree stature combined with increased stem density and generally the lower diversity of woody plants. Trees in these regions are generally shorter and more heavily stemmed than in lower-altitude forests in the same regions, often with gnarled trunks and branches, forming dense, compact crowns. Their leaves become smaller, thicker and harder with increasing altitude. The high moisture promotes the development of a high biomass and biodiversity of epiphyte, particularly bryophytes, lichens, ferns (including filmy ferns), bromeliads and orchids. The number of endemic plants can be very high. An important feature of cloud forests is the tree crowns can intercept the wind-driven cloud moisture, part of which drips to the ground. This fog drip occurs when water droplets from the fog adhere to the needles or leaves of trees or other objects, coalesce into larger drops and then drop to the ground. It can be an important contribution to the hydrologic cycle. Due to the high water content of the soil, the reduced solar radiation and the low rates of decomposition and mineralization, the soil acidity is very high, with more humus and peat often forming the upper soil layer. In drier areas with mainly seasonal rainfall, cloud stripping can amount to a large proportion of the moisture available to plants. Although far from being universally accepted as true cloud forests, several forests in temperate regions have strong similarities with tropical cloud forests. The term is further confused by occasional reference to cloud forests in tropical countries as "temperate" due to the cooler climate associated with these misty forests. Indonesia – Various places in Sulawesi (such as Nokilalaki and Rantemario Mountains), the Maluku Islands (Moluccas – particularly Buru, Seram and Waigeo Islands), and New Guinea (mostly Jayawijaya Mountains and Foja-Mamberamo valleys). Watershed function: Because of the cloud-stripping strategy, the effective rainfall can be doubled in dry seasons and increase the wet season rainfall by about 10%. Experiments of Costin and Wimbush (1961)[non-primary source needed] showed that the tree canopies of non-cloud forests intercept and evaporate 20 percent more of the precipitation than cloud forests, which means a loss to the land component of the hydrological cycle. Vegetation: Tropical montane cloud forests are not as species-rich as tropical lowland forests, but they provide the habitats for many species found nowhere else. For example, the Cerro de la Neblina, a cloud-covered mountain in the south of Venezuela, accommodates many shrubs, orchids, and insectivorous plants which are restricted to this mountain only. Fauna: The endemism in animals is also very high. In Peru, more than one-third of the 270 endemic birds, mammals, and frogs are found in cloud forests. One of the best-known cloud forest mammals is the mountain gorilla (Gorilla b. beringei). Many of those endemic animals have important functions, such as seed dispersal and forest dynamics in these ecosystems. Seaborne moisture is vital to the cloud forest of Fray Jorge that is surrounded by the arid southern reaches of the Atacama Desert. In 1970, the original extent of cloud forests on the Earth was around 50 million hectares. Population growth, poverty and uncontrolled land use have contributed to the loss of cloud forests. The 1990 Global Forest Survey found that 1.1% of tropical mountain and highland forests were lost each year, which was higher than in any other tropical forests. In Colombia, one of the countries with the largest area of cloud forests, only 10–20% of the initial cloud forest cover remains. Significant areas have been converted to plantations, or for use in agriculture and pasture. Significant crops in montane forest zones include tea and coffee, and the logging of unique species causes changes to the forest structure. In 2004, an estimated one-third of all cloud forests on the planet were protected at that time. Because of their delicate dependency on local climates, cloud forests will be strongly affected by global climate change. Results show that the extent of environmentally suitable areas for cloud forest in Mexico will sharply decline in the next 70 years. A number of climate models suggest low-altitude cloudiness will be reduced, which means the optimum climate for many cloud forest habitats will increase in altitude. Linked to the reduction of cloud moisture immersion and increasing temperature, the hydrological cycle will change, so the system will dry out. This would lead to the wilting and the death of epiphytes, which rely on high humidity. Frogs and lizards are expected to suffer from increased drought. Calculations suggest the loss of cloud forest in Mexico would lead to extinction of up to 37 vertebrates specific to that region. In addition, climate changes can result in a higher number of hurricanes, which may increase damage to tropical montane cloud forests. All in all, the results of climate change will be a loss in biodiversity, altitude shifts in species ranges and community reshuffling, and, in some areas, complete loss of cloud forests. Cloud-forest conditions are hard and expensive to replicate in a glasshouse because it is necessary to maintain a very high humidity. This is usually expensive as a high temperature must usually be maintained as well, and a high temperature combined with high humidity calls for good air circulation or else fungi and algae will develop. Such displays usually are quite small, but there are some notable exceptions. For many years, the Singapore Botanic Gardens have a so-called coolhouse, whereas the Gardens by the Bay features a 0.8 hectares (2.0 acres) coolhouse that is simply named "Cloud Forest". The latter features a 35-metre (115 ft)-high artificial mountain clad in epiphytes such as orchids, ferns, clubmosses, bromeliads and others. ^ Clarke 1997, p. 29. ^ a b c d e f g Häger 2006, p. [page needed]. ^ a b c d e f g h i j Hamilton, Juvik & Scatena 1995. ^ García-Santos, Bruijnzeel & Dolman 2009. ^ a b c García-Santos 2007, p. [page needed]. ^ "Resources Data - UNEP-WCMC". unep-wcmc.org. ^ "Fog drip - AMS Glossary". American Meteorological Society. Retrieved 2014-12-15. ^ van Steenis 1972, p. [page needed]. ^ Grubb & Tanner 1976. ^ a b c d Bruijnzeel & Hamilton 2000, p. [page needed]. ^ Ponce-Reyes et al. 2013. ^ a b c Foster 2001. ^ a b c Bubb et al. 2004, p. [page needed]. ^ Ponce-Reyes et al. 2012. ^ "Cloud Forest Facts and Figures". Bruijnzeel, L. A. (1990). Hydrology of Moist Tropical Forests and Effects of Conversion: A State of Knowledge Review. OCLC 222853422. Bruijnzeel, L.A.; Hamilton, L.S. (2000). Decision Time For Cloud Forests: Water-Related Issues And Problems Of The Humid Tropics And Other Warm Humid Regions. Paris, France: UNESCO's IHP Humid Tropics Programme Series No.13. Bruijnzeel, L. A; Proctor, J (1995). "Hydrology and Biogeochemistry of Tropical Montane Cloud Forests: What Do We Really Know?". In Hamilton, Lawrence S.; Juvik, James O.; Scatena, F. N. (eds.). Tropical Montane Cloud Forests. Ecological Studies. 110. pp. 38–78. doi:10.1007/978-1-4612-2500-3_3. ISBN 978-1-4612-7564-0. Bubb, Philip; May, Ian; Miles, Lera; Sayer, Jeff (2004). Cloud Forest Agenda. ISBN 92-807-2399-5. Foster, Pru (2001). "The potential negative impacts of global climate change on tropical montane cloud forests". Earth-Science Reviews. 55 (1–2): 73–106. Bibcode:2001ESRv...55...73F. doi:10.1016/S0012-8252(01)00056-3. Clarke, Charles (1997). Nepenthes of Borneo. ISBN 978-983-812-015-9. García-Santos, G; Marzol, M. V; Aschan, G (2004). "Water dynamics in a laurel montane cloud forest in the Garajonay National Park (Canary Islands, Spain)". Hydrology and Earth System Sciences. 8 (6): 1065–75. Bibcode:2004HESS....8.1065G. García-Santos, G. (2007). An ecohydrological and soils study in a montane cloud forest in the National Park of Garajonay, La Gomera (Canary Islands, Spain) (PhD Thesis). hdl:1871/12697. García-Santos, G; Bruijnzeel, L.A; Dolman, A.J (2009). "Modelling canopy conductance under wet and dry conditions in a subtropical cloud forest". Agricultural and Forest Meteorology. 149 (10): 1565–72. Bibcode:2009AgFM..149.1565G. doi:10.1016/j.agrformet.2009.03.008. Grubb, PJ; Tanner, EVJ (July 1976). "The montane forests and soils of Jamaica: a reassessment". Journal of the Arnold Arboretum. 57 (3): 313–68. JSTOR 43794514. Häger, Achim (2006). Einfluss von Klima und Topographie auf Struktur, Zusammensetzung und Dynamik eines tropischen Wolkenwaldes in Monteverde, Costa Rica [Influence of climate and topography on the structure, composition and dynamics of a tropical cloud forest in Monteverde, Costa Rica] (Disssertation) (in German). hdl:11858/00-1735-0000-0006-B0EE-1. Hamilton, Lawrence S; Juvik, James O; Scatena, F. N (1995). "The Puerto Rico Tropical Cloud Forest Symposium: Introduction and Workshop Synthesis". In Hamilton, Lawrence S.; Juvik, James O.; Scatena, F. N. (eds.). Tropical Montane Cloud Forests. Ecological Studies. 110. pp. 1–18. doi:10.1007/978-1-4612-2500-3_1. ISBN 978-1-4612-7564-0. Kappelle, M (2004). "Tropical Montane Forests". In Burley, Jeffery (ed.). Encyclopedia of Forest Sciences. pp. 1782–92. doi:10.1016/B0-12-145160-7/00175-7. ISBN 978-0-12-145160-8. Ponce-Reyes, Rocío; Reynoso-Rosales, Víctor-Hugo; Watson, James E. M; Vanderwal, Jeremy; Fuller, Richard A; Pressey, Robert L; Possingham, Hugh P (2012). "Vulnerability of cloud forest reserves in Mexico to climate change". Nature Climate Change. 2 (6): 448–52. Bibcode:2012NatCC...2..448P. doi:10.1038/nclimate1453. Ponce-Reyes, Rocio; Nicholson, Emily; Baxter, Peter W. J; Fuller, Richard A; Possingham, Hugh (2013). "Extinction risk in cloud forest fragments under climate change and habitat loss". Diversity and Distributions. 19 (5–6): 518–29. doi:10.1111/ddi.12064. van Steenis, Cornelis Gijsbert Gerrit Jan (1972). The Mountain Flora of Java. Brill. OCLC 741884105. Vogelmann, H. W (1973). "Fog Precipitation in the Cloud Forests of Eastern Mexico". BioScience. 23 (2): 96–100. doi:10.2307/1296569. JSTOR 1296569. 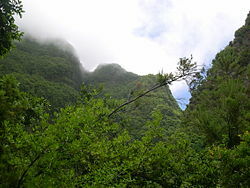 Wikimedia Commons has media related to Cloud forests. Costin, A.B. ; Wimbush, D.J. (1961). Studies in catchment hydrology in the Australian Alps. IV, Interception by trees of rain, cloud, and fog. OCLC 822214607. Stadtmüller, Thomas (1987). Cloud Forests in the Humid Tropics: A Bibliographic Review. ISBN 978-92-808-0670-0.